This page is an introduction and tutorial that will get you familiar with Terminator’s features. Additional functional areas are explored in other pages, but at the end of this page you’ll be getting a good idea of the power of Terminator. There may be some cosmetic differences, but it should look fairly similar. It may in fact look a little too minimal to some of you, but this is a deliberate policy. Keep the focus on the terminal, not on a cluttered interface. This is why we don’t waste space on a traditional menu bar and toolbar. 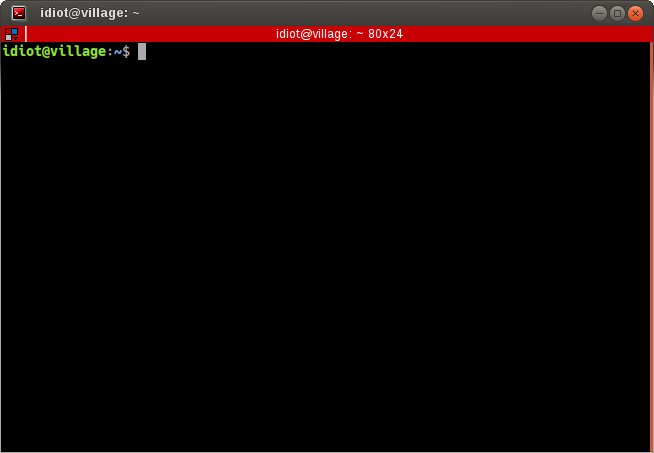 Even the terminal scrollbar and titlebar (the red strip) can be turned off, although you do lose ease-of-access to some of Terminators more powerful features if you do. You will never see a window that looks like this, as it is impossible to have both menus up at the same time. The Context Menu - This is the main menu reached with right-click over a terminal, and will let you access all the settings, profiles, shortcuts and configurations. It is however kept brief to avoid the mega-menus that sometimes grow unchecked. The Grouping Menu - This is reached with a click on the trio of coloured boxes in the titlebar. Later, when we cover Grouping and broadcasting to multiple terminals we will cover this properly. For now it is enough to know where it is and how to trigger it. By default titlebars are shown. If the titlebar has been hidden The Grouping Menu functions will be added as a sub-menu to The Context Menu. Between the terminals you can see a space that is a splitter grab handle. You can grab these and drag them, and the terminals will resize. In this way Terminator acts a lot like a tiling window manger. 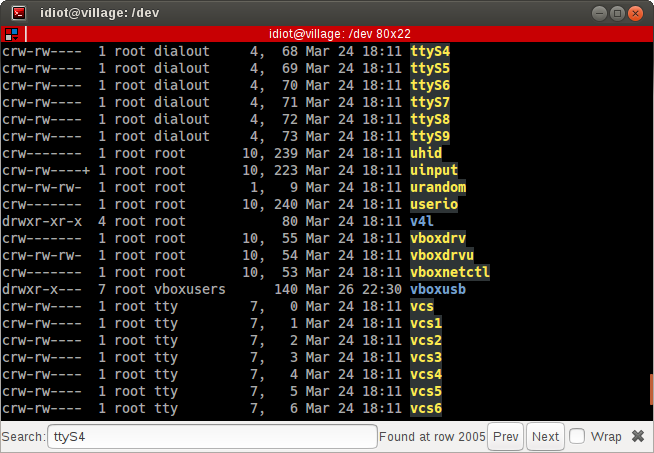 It lets you arrange many terminals in a single view, allowing adjustments as your needs change. The last item in this part of the menu is to Open tab. 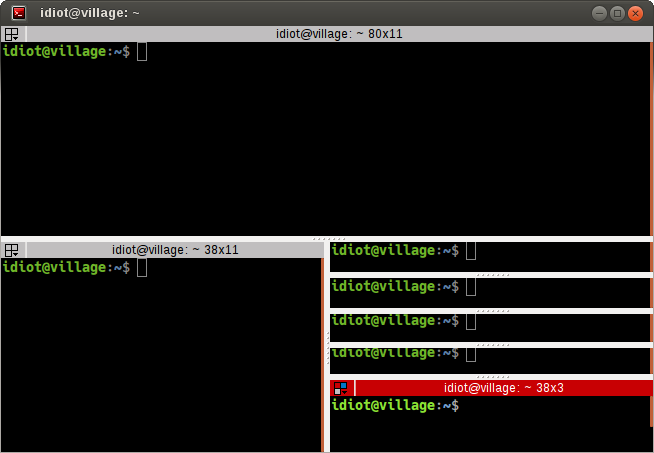 This will give you a tab like most other terminal programs. 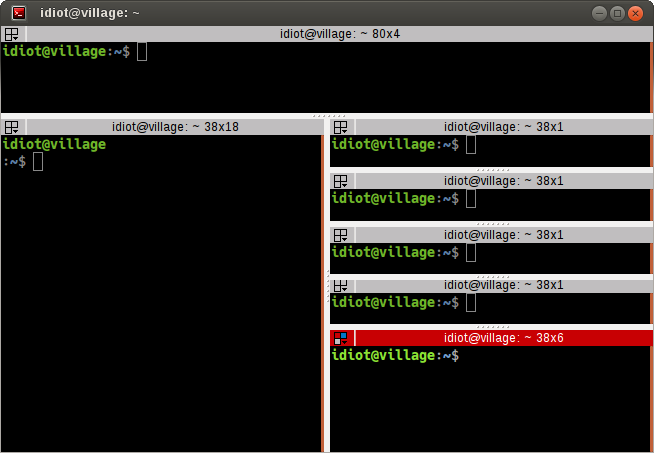 Unlike most other terminals, in Terminator you can also split the terminals in each tab as often as you like. The same effects could have been achieved with shortcuts, and is the case for most actions. The third part of the menu will Close the current terminal. It’s on its own to prevent accidents. The entries in the fourth part allow you to temporarily focus on one terminal. Zoom terminal will zoom into the current terminal hiding all other terminals and tabs, and increasing the the size of the font. This can be handy to eliminate distractions, give yourself a bit more space for the current task, or even when giving presentations or training. 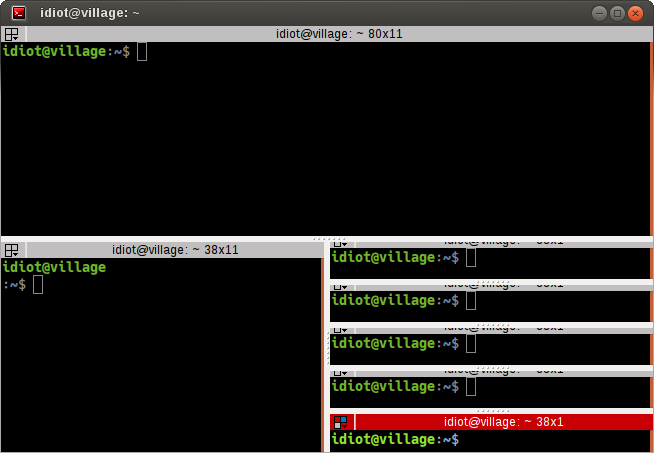 Maximise terminal is almost identical, except that it does not increase the size of the terminal font. When you are zoomed or maximised it is not possible to split terminals, or create new tabs, so the entries for those actions disappear from the menu. So too do the zoom and maximise options, and in their place is a Restore all terminals entry. This will take you back to your windows original layout, and restore the font size if necessary. An outstanding issue is that sometimes the font size selected when zooming in can be a bit extreme. You can use Terminal zooming to increase and decrease the font size if this happens. This will not affect the restored font size. The fifth part of the menu has three items. 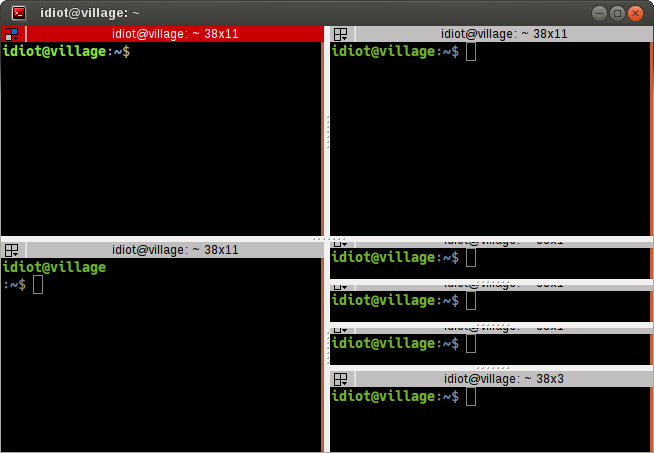 Show scrollbar will toggle the scrollbar on a per terminal basis. There is also a way to define this in the Profiles. Preferences lets you configure and tune Terminator to better suit your needs and is further described here. Lastly, Encodings will allow you to select a different encoding to the default of UTF-8. There are actually additional optional items that can be added to the menu that will only be shown if you enable those Plugins that add menu items. Although as you’re reading this, I guess you figured that one out! Once the Context menu is visible, it can be navigated with the arrow keys. For me the two different sets of next/prev shortcuts are a bit of a mystery. Something to look into. Will try to open the item in a suitable program depending on what the type of the item is (see below). The description might be different depending on the type of the item (see below). In some types this may be converted into a different form depending on what the item represents. URL Note Made up example, Don’t use! These are just the ones built-in by default to Terminator. The Plugins can extend this further with a URL Handler, although strictly speaking it does not have to be a URL - as can be seen from some of the above - just a well defined pattern that can be matched. I’ve already used the term layout a few times in this page already. I should define what exactly is meant by a layout. A layout describes the collection of windows in the current process, the tabs, and how the windows and tabs are divided up into terminals. It also includes the positions, dimensions, as well as other aspects related to how Terminator looks. Besides the items in the The Context Menu there are three main methods to adjust the layout. Terminator lets us rebalance the terminals, equally dividing the available space between the siblings. But there’s more! We can use two modifier keys to rebalance more collections of siblings. Shift+double-click the splitter and all children, grandchildren, and so on, will be rebalanced. Super+double-click and all parents, grandparents, and so, on, will be re-balanced. You guessed it! Shift+Super+double-click and all visible terminals will be rebalanced. It will not affect terminals in other windows or tabs. Notice in the last two shots that you can shrink a terminal to a point where it is unusable or even completely hidden. We don’t place an arbitrary minimum size. Some people want the ability to move the splitter all the way. Here you can see a preview of the dragged terminal - scaled if large - and shading to show which area it will cover, which can be the top, bottom, left or right of an existing terminal. 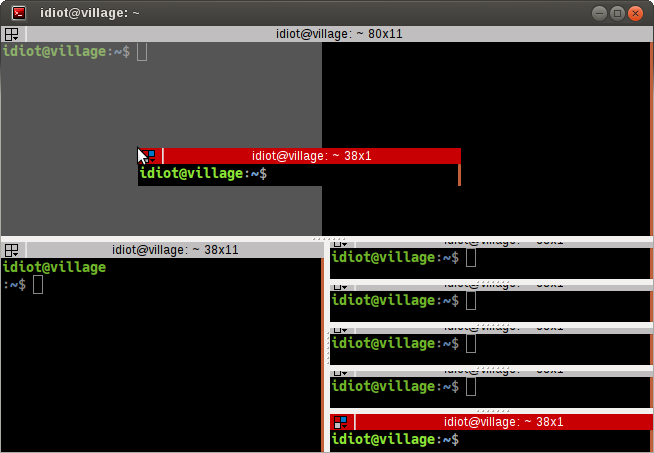 The other way to drag a terminal can be done from within the terminal with Ctrl+right-click-drag. With this method once you start the drag, you must release the Ctrl key before releasing the right-mouse-button. If you do not the drag will cancel. You can drag between tabs by initiating a drag and hovering over the tab. Terminator will switch to the tab under the cursor, you can then drag to the desired position, and the terminal can be dropped. You can also drag between Terminator windows provided the windows are part of the same process. By default all windows will be part of the same process. Windows will not be part of the same process if you deliberately turn off the DBus interface with the Preferences or the Command line options when starting Terminator up. Layouts are also currently isolated at a process level for technical reasons. 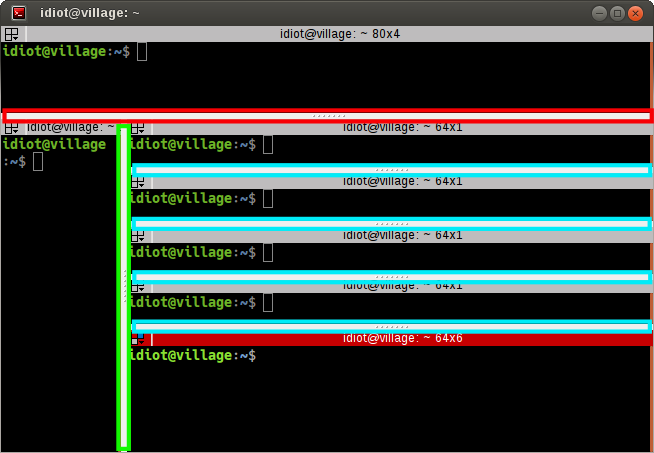 - Needs to be double checked and confirmed.Since the work that got layouts working over DBus, this may now be wrong. This is a separate process. As such, drag and drop will not work to or from this new window, or subsequent windows launched using the Shift+Ctrl+I while the focus is in the new instance. Hide window will currently only work on the first window of the first terminator instance that you start. That is because at present it binds the shortcut globally (it has to, or it cannot unhide) and this can only be done once. This may change in future. 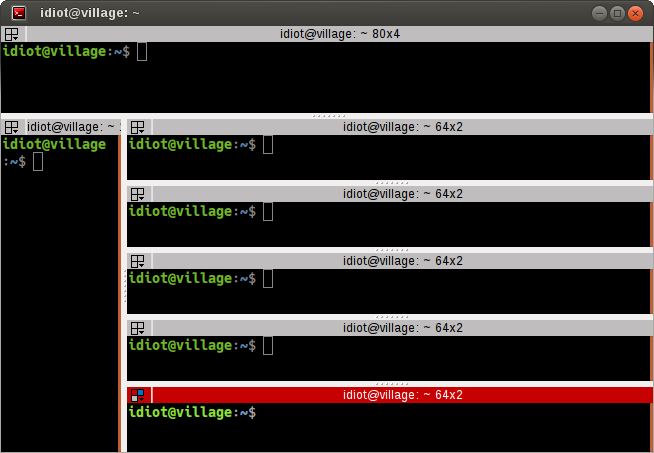 There are two shortcuts available for fixing the terminal if it starts to misbehave. As already mentioned, there is a Context Menu item to toggle the scrollbar. There is also a shortcut listed here. [VS] (1, 2) VTE Shortcuts: Default actions from VTE that are not configurable. [XL] X Lines: Where X may vary depending on distribution. On mine it is 4. [TS] (1, 2, 3) Terminator Shortcuts: Additional movement options from Terminator that are configurable. [MS] Masked Shortcuts: VTE provides default shortcuts for line up/down, on Shift+Ctrl+Arrow Up/Dn, but they are masked by shortcuts for resizing terminals. 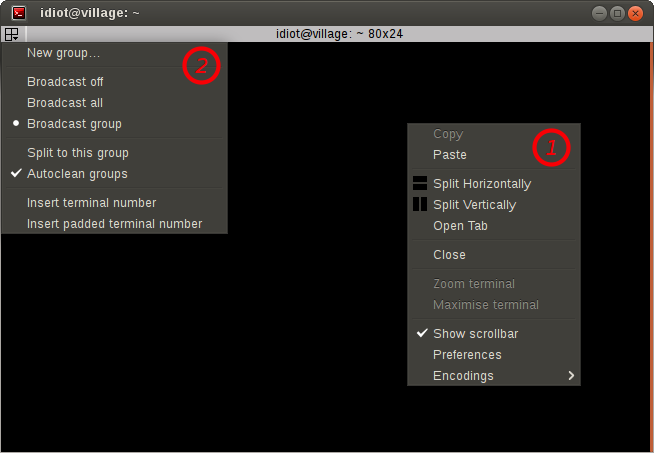 You can disable or reassign the resizing shortcuts to regain access to the VTE default. It is possible to search the buffer, although at this time there is a limitation that the found string is not highlighted. This has buttons for moving back and forward through the results, as well as an option to wrap the search around. At this time there is no highlighting of the search string. This is a historical limitation due to the manner in which the implmentation was originally done, way back when. I intend to remove the old code, replacing with the built-in libvte search function in the 2.1 release. This will then highlight searched text. It is possible to zoom into and out of a terminal. There are also some modifiers to zoom more than just the current terminal. Target terminal is the current terminal when using the keyboard shortcuts, or the terminal under the mouse when using the wheelup/wheeldown. If you’re anything like me, you’ve spent time clicking among the half a dozen different terminals in the taskbar, trying to find the right one. Or maybe for you it is with tabs. 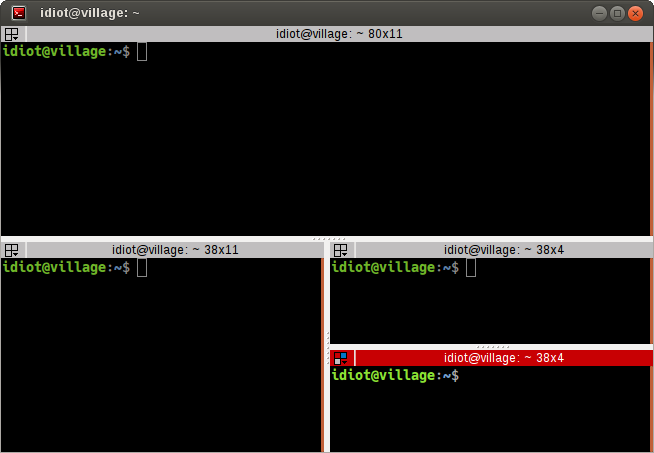 Additionally all three can be saved/loaded from a layout, or the window title can be set using a command line option. 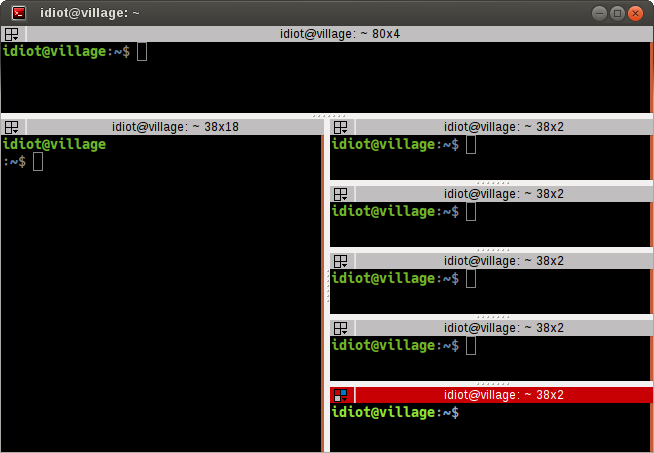 These shortcuts let you enumerate your terminals. It is handy if you need to login to a number of sequentially numbered machines. With multiple terminals the ordering may seem strange, but this is due to the nature of the splitting and the order in which the splits were performed. These actions can also be done from The Grouping Menu. It is possible to cycle back and forth through the available profiles that are defined in the Profiles tab of the Preferences Window, changing the behaviour and appearance of the current terminal. In both cases there is currently no default shortcut set. I’m not convinced they would be used often enough to warrant assigning them. For those that find it useful, the feature is there to be configured.